WPPJ is a student-run mixed-format college station, meaning it plays music from a wide variety of genres: hip-hop to indie rock; Warp Records to K Records. WPPJ provides a co-curricular activity for students with an interest in radio, news, sports, contemporary/popular music, media sales and promotions. WPPJ also serves as a training facility for students of any major who desire a career in professional broadcasting. It also provides a medium of intra-university communications over the air and via the Web. WPPJ is a partner with Pacifica Radio Network, the oldest non-commercial broadcast network in the United States. This partnership provides staff members the opportunity to broadcast their news reports on Pacifica Internet and broadcast member stations. Pacifica programming will also be broadcast on WPPJ. 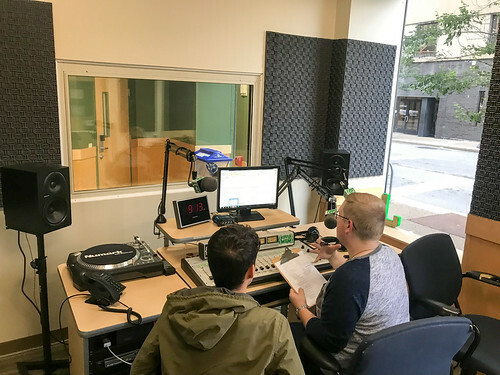 If you have any questions or would like to join its staff, visit the radio station on the first floor of Conestoga Hall.